The white-clawed crayfish is Ireland’s only crayfish species. Ireland is now thought to hold some of the best European stocks of this species, under least threat from external factors. Irish stocks are believed to be of substantial conservation importance. Throughout its natural range across Western Europe the distribution and abundance of white-clawed crayfish has been dramatically reduced in the last 150 years due to human disturbances such as overfishing, habitat destruction, pollution and the introduction of foreign crayfish species. In Britain, the North American signal crayfish was introduced for aquaculture and subsequently escaped into the wild where it has had a devastating effect on the white-clawed crayfish. While this species has not been recorded in Ireland yet there is a real threat that this alien crayfish species will reach Ireland. The crayfish plague, which was transmitted by introduced crayfish species and is caused by the fungus Aphanomyces astaci, has been found in Ireland since the late 1980s. Crayfish are large, mobile freshwater invertebrates and are considered keystone species wherever they occur. They are slow growing compared to other astacids and reach a total length of 9cm and a weight of 40g in five or more years. Their ultimate length is perhaps 12cm. Crayfish grow by moulting their shell and increasing by about 10% in length before the new one hardens. Immature crayfish may moult several times each year, but mature males usually moult twice, early and late summer. Reproductive females moult only once, in late summer. The body is smooth, generally brown to olive in colour, and has a pitted appearance. White-clawed crayfish have a sharp spine on the shoulder of the carapace that does not occur in signal crayfish and is a good way of distinguishing between the two species. Adult males have larger claws than females and are more territorial, especially in the mating season. Females develop a broader abdomen, which accommodates the brood. Males can also be distinguished from females by the specialised first two pairs of appendages on the undersides of the abdomen. The appendages function like a plunger to introduce a white spermatophore onto the underside of the female during mating. Mating occurs in October to November at a water temperature of around 10ºC, during which males immobilise females with their claws and deposit a white spermatophore on the base of their walking legs. The females’ abdominal appendages are more hairy than those of the male and are used to support the mass of eggs, which is glued to them after laying. The number of eggs carried may range from 20 to 160, but is usually less than 100. Such females are described as “berried” and will over-winter with their clutch. About 50% survive to hatch in June or July. The hatchlings remain attached to the mother until their second moult, when they become independent. The female can then resume feeding and moult. The presence of juveniles would indicate a healthy breeding population of white-clawed crayfish. Crayfish can live for more than 10 years, and usually reach sexual maturity after three to four years. White-clawed crayfish can occur in a variety of habitats such as rivers, canals, millraces and lakes. They can be found in a wide range of substrata, once suitable refuges are available. Refuges such as boulders, rocks and cobbles, tree roots, vegetation etc. are used. Juveniles are typically found between weeds and debris in shallow water. The white-clawed crayfish is largely nocturnal, although it can be seen foraging in the shallow margins of lakes as dusk approaches on warm summer evenings. 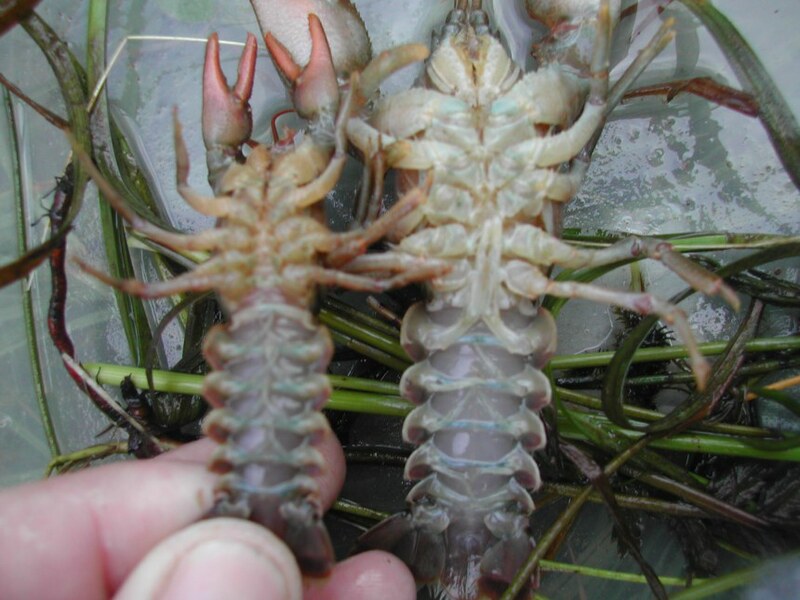 Freshwater crayfish require relatively hard water with high calcium levels. It was though that the living requirements for white-clawed crayfish are similar to brown trout, with good water quality. However research now suggests that crayfish in Ireland can tolerate some pollution. In Irish surveys crayfish have been most often found in unpolluted waters but have also been found in slightly polluted and moderately polluted waters. Some populations have even been found at sites with very low water quality. The grazing impacts of crayfish on aquatic macrophytes have long been known, their grazing checks primary productivity and in their absence, luxuriant macrophyte growth may occur. In Irish lakes the white-clawed crayfish prey on a wide variety of benthic invertebrates including snails, crustaceans and insect larvae. Crayfish of all species seem to prefer animal to plant food. In White Lake, Co Westmeath, where white-clawed crayfish were re-introduced, sub-yearlings fed chiefly on small entomostracan crustacea and insect larvae. Larger crayfish in this lake fed predominantly on stoneworts while the largest specimen recorded was feeding on both dead terrestrial vegetation and juvenile crayfish. Dragon fly nymphs and large crayfish may be significant predators of juvenile white-clawed crayfish. Other predators include herons, salmonids, eels, perch and pike. Crayfish are important in the diet of otters. White-clawed crayfish are still widespread in the rivers of the Irish midlands, where the geology is predominantly limestone. However, the distribution of white-clawed crayfish in rivers has been restricted since the mid-1980s. This was attributed in part to an outbreak of the crayfish plague caused by the fungus Aphanomyces astaci. It has also been reported that crayfish populations in the lakes and rivers of the Boyne catchment were likely to have affected by crayfish plague. However this effect is geographically isolated. 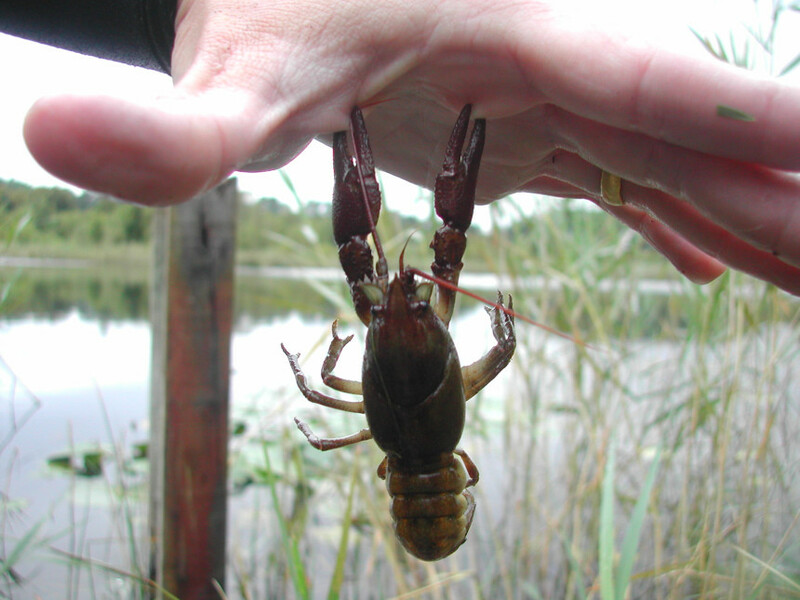 Large unexplained mortalities of crayfish have occurred in waterbodies including Lough Owel. The main threats to the white-clawed crayfish in Ireland are drainage and drainage maintenance, pollution and the introduction of predators, competitors or diseases. 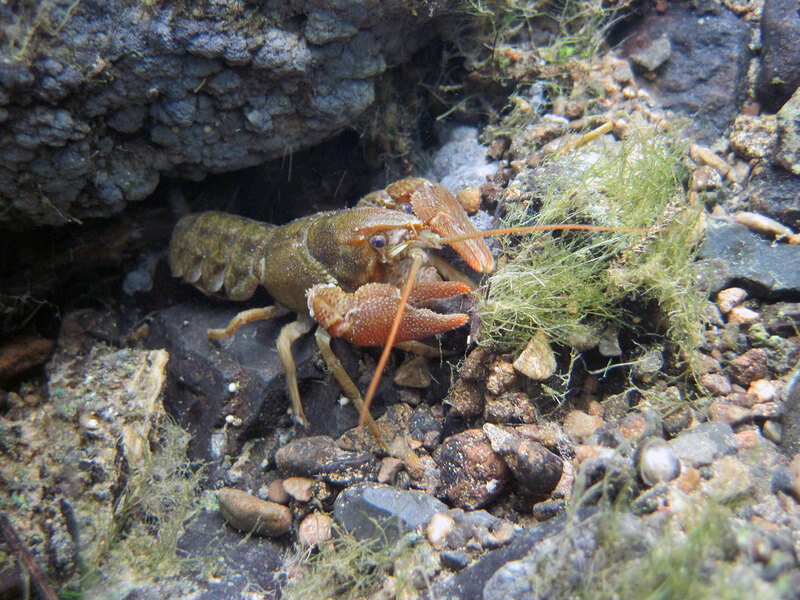 European crayfish possess no resistance to the Aphanomyces astaci fungus that has the potential to eradicate complete stocks of crayfish in a matter of weeks. This fungus attaches to thin areas of cuticle as a spore and then grows through the tissues, leading to death in around two weeks. The swimming spores then transmit directly from the infected or recently dead crayfish. This disease has caused the eradication of crayfish from Irish lakes including Lough Lene and Lough White. White-clawed crayfish were reintroduced to White Lough by National Parks and Wildlife Service and Trinity College Dublin in 1999 and were confirmed breeding in 2003. Found 5 crayfish in a pond near Clondalkin yesterday. Last year some foreign nationals were regularly netting crayfish for consumption using slightly rotten bacon/ham as an attractant or bait and childrens minnow nets to capture them, between Hazelhatch and Lyons Estate on the Grand Canal. Are native Irish white-clawed crayfish a protected species ? We have them in my class! Large amount found dead in river suit this evening. Hundreds in a relatively short beat at Kilsheelan. Have a photo of a blue claw taken on the Blessington lakes 2 years ago posted it on facebook and someone says its a crayfish claw . Thought u might be interested in it . Hi there, this morning I saw a white-clawed crayfish WALKING along the tarmac path beside the distribution canal that runs from Lough Owel to the Royal Canal in Mullingar (exact location 53°32’18.7″N 7°20’41.0″W). It was very conspicuous and I didn’t want a dog to hurt it so I picked it up and placed it out of sight on the bank of the distribution canal. The distribution canal was dredged last weekend so I reckon this disturbed it. Are they to be found in the Lee? Does this mean the female doesn’t feed or grow from possibly October when she’s mated until June when her brood undergo second moult and leave her? Or does she feed to keep her metabolism ticking over but she just doesn’t moult (grow)? Noel, that could be caused by the river levels/gauges too low – that reduces the habitat for crayfish and you are more likely to spot them. In parts of continental Europe the drought has been so bad this summer that lots of crayfish could be easily spotted surviving (or dying) in shallow streams or even just pools of water left in beds of what normally are middle sized rivers. Am part of a group called FOTC. friends of the camac. The camac river flows from brittas in wicklow through saggart clondalkin entering the liffey at huston stn. We as a group are in operation about a year &on our monthly clean ups on the river we have found a triving population of white claw crawfish any tips on protecting there hahitate would be of help to us.